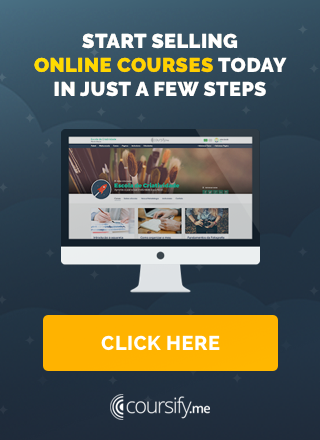 Want to sell online courses? Start by answering the following question: how I create an online class that my students will love? There is a whole to-do list on how to create an online class, including checklists that you can follow to stay on track. But little is said about how to go further in the process of creation and develop an original course that pleases and attracts your target audience. The truth is that there isn’t a ready formula, but some strategies you can apply to know if you are going in the right way. So read carefully the tips we’ve listed below on how to create an online class successful, because their purpose is to help you create something your students will love. Recall why people take courses in the first place: learn something that will bring some change to their lives. Whether for professional or hobby reasons, those looking for an online course seek new knowledge, something that will cause some transformation, that will add value to their lives. Maybe they do not know Java and their work requires them to learn – you teach them. Maybe they do not know how to cook – you teach them. Maybe they do not know how to play the guitar – you teach them. The key to a good course is that there is a transformation and, at the end of the course, someone knows something they did not know before. A successful course is one that functions as a short and sweet shortcut to a result. You simply have to guide your student to the transformation and preferably in the shortest possible time. So whenever you have questions while you are creating your course, simply ask yourself, “Will this help my students reach the transformation or not?” If it is a yes, do so. If it’s a no, then do not worry about it. Before you worry about how to create an online class and start creating multiple chapters and sections, know you should never produce all the content before you sell at least part of the course. Why? Simple, you need feedbacks to know what you are doing right and wrong, and this will only happen after someone sees your content. Create a first lesson and make it available as an online mini-course or teaser, or as a free course to get more people to your mailing. Anyway, put this small piece of your online course to the shows and wait. If you want, you can even ask or encourage people to leave comments. You will be surprised. Criticism may not be about content, but technical aspects such as bad lighting, very fast speech, weak microphone, etc. The kind of thing that you, concerned about the content, would not realize alone and that make all the difference in the final quality of the course. In addition, you will also hear good things that can help you set up a more assertive course, such as subjects your students want to hear more information or aspects they love about your course. With this feedback, you can tailor the remaining content to the wishes and needs of your audience. Offering a more personalized course can be the difference, the extra value your audience is willing to pay for. By creating this first part, you will also gain more confidence to continue, as well as having a much clearer sense of the time and effort required to create an online class and therefore how much it should cost. It is common for teachers to drown their students in theory and concepts from the outset, making the learning process time consuming and ending by losing their interest. Instead, when you are going to think about the steps of how to create an online class, make sure you take your students on a consistent journey of small wins. A meditation course: Ask your students to sit and meditate for 5 minutes, no matter how many times they lose concentration. They will feel that they are doing something and will be optimistic to continue. A vegetarian cooking course: Ask students to prepare a different yet simple dish. They will have a small victory ready to be tasted. A financial education course: Help your students put together a simple spreadsheet, to control household spending, and they’ll feel they’ve already learned something useful. A coding course: Have students create “Hello World,” the most basic coding program you can create and run for any language. It seems progress because it is. Make sure you value and highlight the progress your students are making. Every time we are asked about how to create an online class, we like to remember the following: The success of your course is directly proportional to your student’s success. So always think about what is best for him. If you are teaching how to build a blog, celebrate each complete stage, and remind your students of everything they have learned so far, such as configuring layout, installing plugins, etc. Set your course so that your students do not fail, even if they progress slowly, and with each new lesson, highlight what they have already achieved. Be encouraging and positive. Make your students leave your course motivated, with a sense of what they are capable of. Do not promise the world. Make it clear what will be taught throughout the course and what skills students will achieve. This not only sets expectations, but also determines who your target audience is, or rather what level of knowledge they need to have to take your course. After all, you do not want to fool anyone, and you want everyone to be successful. And even if you have to approach more complex ideas at certain times, reassure your audience that in the course of the lessons they will understand better, and that they can always review the content and ask questions. Warnings like this keep the student calm and motivated, confident that they will learn. Now, among all the tips, the secret of how to create an online class successful is basically one: keep your students interested. Holding the student’s interest is the key so that he does not give up on the mission right at the beginning. The more challenging and interesting your course is, and the less it seems like an obligation or work, the better. To achieve this, a good strategy is to get small tasks (able to be carried out) after each class. Then you can ask your students to comment or share the results of their assignments with others so they can discuss the subject. This can be done through a chat, live streaming, online conference, whichever is easier for everyone. The important thing is that the benefits are numerous. First, it makes students feel “perceived” and valued, part of a group. Second, it gives them the feeling that they are actually accomplishing something and getting somewhere, acquiring a knowledge they did not have before. When you involve your students in their own learning, you share with them the responsibility for their own evolution. When you talk about something you like, it is very common that you end up talking too much. It is not unusual to find online courses that tend to be overly long and time-consuming. To avoid falling into this trap, remember the first law on how to create an online class successful: it must be a SHORTcut for a result. People make a course to learn something quickly, not to accumulate a thousand quotations and data. You will not earn bonus points for making the course longer than it should. Frankly, you’re wasting your audience time and possibly losing students in the long run. Although there are variations on what is right and always exceptions, the aim is to create lectures with less than 15 minutes. Four to eight minutes gives enough time to talk about something without losing students’ attention. If you are not convinced, put yourself in the student’s shoes. Think that you (the student) are probably doing this course late at night or on the weekends. You are tired, investing your free time, and suddenly you come across a 40-minute lecture. Even if you are compromised, we bet that after 15 minutes you will be thinking about something else and seriously considering leaving the course for later. Now, if it’s a 5-minute lecture, well, that’s quick. There is a minimum investment of time, and if you continue, you will quickly have finished a lesson. Besides being easy to review if you have any doubts. Try to teach only one or two main concepts in each lesson. Divide longer video recordings. Do not be wordy. A LMS, as its name implies, is basically a SaaS (software as a service) that functions as an online classroom. Through this platform, instructors can make their online classes available. What’s more, a LMS has a number of features your business will need, such as integration with other content platforms and ways to get paid online. Present in more than 60 countries, Coursify.me is a complete eLearning platform, the perfect solution for you to start your own business without having to invest anything for it. To learn more, visit our website, test the platform and understand why we are the best option for you to create an online class.